Note that payment is due at time of registration. This can be done by Cash, Check or Charge. Cancellation Policy: MIY STUDIO reserves the right to cancel class up to 1 week before the class date and registration fee will be refunded in full. If students cancel class 2 weeks before class they will receive a refund. Classes cancelled 2 weeks or less before class do not receive a refund. Buy for Pennies to the Dollar from 10 different Quilters, Knitters and Textile Artists Great shopping opportunity for your next creative project! If you would like to Sell your extra fabrics, Yarns, Quilting Supplies, Textile supplies contact Anelie to reserve your spot! In this workshop learn to add a beaded dragonfly to a quilt block, and learn to quickly add a silhouette of one of your family members to your quilt. It will be a fun day! Teacher supplies all of the items needed for your dragonfly, and silhouette, to keep the supply list short! Enjoy. In this class we will be using a variety of Applique Techniques to make this wall hanging. Our focus will be finished edges and stitched by hand. We will explore a variety of ways to finish edges using freezer paper and starch, interfaced lining and needle turn applique. Learn the applique stitch so it will be invisible. We will also learn to make a perfect center circle and stitching a blanket stitch by hand. This wall hanging will teach the traditional technique of Celtic applique. In class students will learn to do this technique using machine stitching and/or hand stitching. Students will have 4 different center design options. This technique will also cover putting inserts into the design. This method of making bias can also be used to make vines or stems in any applique design. When made this way the strip has some body to it and adds dimension to the applique design. It can be confusing to cut the bias from fabric and we will learn this in class so it is easy to understand. 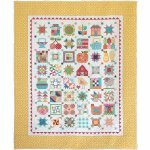 Fancy Forest is a delightful sampler quilt featuring some of Elizabeth Hartmans most popular blocks. There are five forest creatures and a couple of quick and easy thistle blocks. All blocks are made using simple straight or diagonal seams, no matter how complex the quilt may look. There are NO templates and there is NO paper piecing. This is a four class series quilt. The small quilt (35X 47) is one quarter of the larger quilt and is great for a baby quilt or wall hanging. The large quilt (67 X 91) is perfect for a twin bed or to be used as a sofa quilt or a generous sized lap quilt. Color, color, color is the name of the game with this happy and fun quilt. Students will learn the basics for Quilting with a standard home machine. The focus of the class will be to learn how to use Quilting Rulers to help in creating amazing quilting Designs. This is a technique class so students will make small samples of quilting designs. These samples can then be stitched together to make a quilt or small project. This Bunny project can be a pillow or a wall hanging. We will use a 12 inch block and add borders to it. Then the fun will begin in creating this soft bunny that has rested herself in front of the Block. The floppy ears and a bit of stuffing to the body makes this bunny oh so cute! Come join us for a really fun and creative class using alcohol inks! This brightly colored medium is fun to use and versatile enough to create anything from an abstract design to a detailed flower arrangement. The process is so easy, anyone can do it! We will use inks on both glossy photo paper to create greeting cards, and on 4" x 4" ceramic tiles to use as Art displays or coasters. All the supplies you need will be included in the class. This apron is a great project for those beginning to sew. We will learn how to make a French seam and topstitching to look like a professional. Very Modern style apron for young and seasoned chefs. A great Mothers Day gift.... Just sayin. Fabrics can be cottons, linens or Blends. A solid color is classic but prints are adorable too! Price of class includes pattern. Learn how to use your computer program to make a label that is printed on fabric. Students will design 4 labels and print them in class. Labeling quilts is so important as in the future the quiltmaker is not around to give the story. So learn an easy way to make labels so your quilts will have important information on them. This Tuffet is all the craze!! Make your own custom Tuffet using your fabrics to match your decor. We will take two classes to complete this project. The first will be to sew the Tuffet cover and the second will be covering and assembling the Tuffet. Kits available that have all the hardware, legs and foam. Just add your fabrics. Discover the ease of working with wool while learning to stitch this adorable Pincushion. This project includes a variety of Embroidery stitches and embellishing. Yvonne has been stitching with wool for quite awhile and has learned along the way. She will be sharing her knowledge as she teaches this project. Each month we will explore another block and learn a new piecing method. This quilt is so adorable and the blocks can go together as a finished quilt or you can make wall hangings, pot holders, pillows and more. So adorable you will want to make them all! Quilting and friendship is the passion of this group. Often they will all work on the same class project but they also work individually. These ladies enjoy their visiting time together as much as they enjoy their Quilting time together. Join this Friday group and get your unfinished projects done. Often we set aside a project because we are not sure of what the next step is or sometimes we have done something wrong and do not know how to fix it. Anelie will help you with any questions you may have iin getting your quilt or project to get finished. This group has a Wild time while making their projects in class. Often they will all work on the same class project but they also work individually. Enjoy a Quilting Get Away at a Beach setting with other Quilting Friends! Work on your own project of take this time to learn about Free-motion Quilting, Ruler Work Quilting, Feathering, Trapunto and much more. Relax with a stroll on the beach, a massage and perhaps a glass of wine. No need to worry about cooking as a chef will prepare our meals! All ingredients for a great time! This little travel case is perfect for taking along the Must Have oils while you are traveling or just to keep with you to have at all times. It takes a minimum amount of fabrics so go to your scrap pile and find a few you like. The zipper opening is a breeze to put in so do not let that stop you. An elastic strip of elastic holds the bottles in place and keeps them upright. Kit available for $8.